conditions on sheetmetal components. The robot/roller-head combination is designed to produce a number of options, from radiused to angled flanges or flat-hemmed safety edges. The flexible equipment can accommodate a number of component variants and different forms. 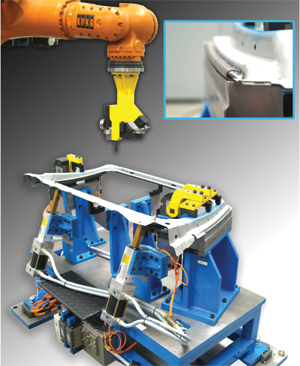 DVA, known for manufacturing hemming-closure solutions for vehicle bodies, developed RoboForm for U.S. manufacturer Ogihara, which employs the system to produce a curved flange on the rear door of the Lincoln MKT crossover SUV.